This newsletter summarizes developments related to the work at Princeton during a six-month period through April ’76. 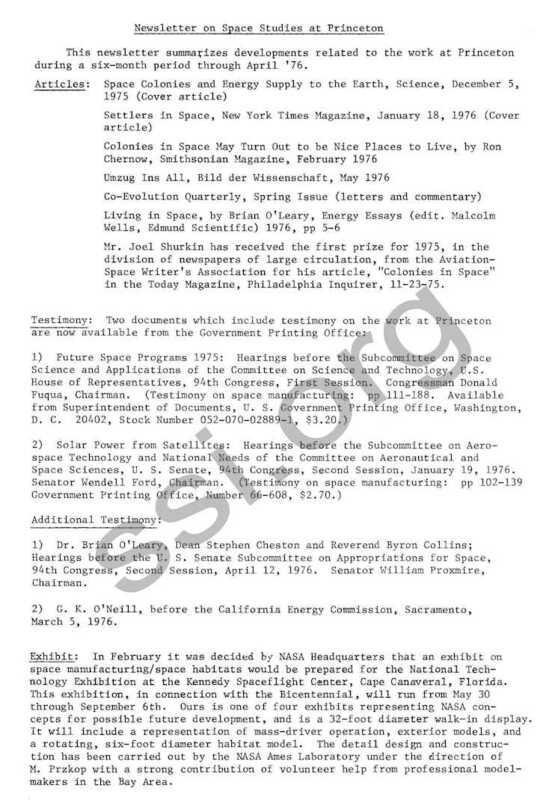 Mr. Joel Shurkin has received the first prize for 1975, in the division of newspapers of large circulation, from the Aviation­Space Writer’s Association for his article, “Colonies in Space” in the Today Magazine, Philadelphia Inquirer, 11-23-75. 1) Dr. Brian O’Leary, Dean Stephen Cheston and Reverend Byron Collins; Hearings before the U. S. Senate Subcommittee on Appropriations for Space, 94th Congress, Second Session, April 12, 1976. Senator William Proxmire, Chairman. 2) G. K. O’Neill, before the California Energy Commission, Sacramento, March 5, 1976. In February it was decided by NASA Headquarters that an exhibit on space manufacturing/space habitats would be prepared for the National Technology Exhibition at the Kennedy Spaceflight Center, Cape Canaveral, Florida. This exhibition, in connection with the Bicentennial, will run from May 30 through September 6th. Ours is one of four exhibits representing NASA concepts for possible future development, and is a 32-foot diameter walk-in display. It will include a representation of mass-driver operation, exterior models, and a rotating, six-foot diameter habitat model. The detail design and construction has been carried out by the NASA Ames Laboratory under the direction of M. Przkop with a strong contribution of volunteer help from professional model­makers in the Bay Area. A special study has been authorized by NASA Headquarters, to take place at the NASA Ames Research Center. It will begin on June 21 and run for six weeks. Building on the large amount of work done by our 1975 Study, this will concentrate on three key technical problem areas: transport of material from the Moon to free space, the chemical processing in space of ores, particularly Ilmenite, obtained from the Moon, and the details of the evolution of an Earth-launched construction station into a manufacturing facility/space habitat built primarily of lunar material with the constraint of maintaining adequate cosmic-ray shielding at each stage. Participants in the 1976 Study will be senior professional people from the aerospace and lunar science fields, assisted by students. 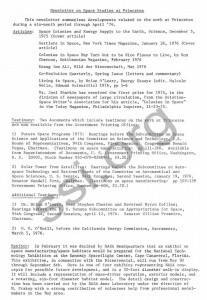 The Third Princeton Conference on Space Manufacturing will be held in May 1977. Provision will be made for both invited and contributed papers, and details will be published when arrangements are further along. Dr. Brian O’Leary and I invite inquiries from undergraduate students, now entering their senior year, who would be interested in experimental research in Planetary Physics leading to a Ph.D. degree in Physics. There is no such program at Princeton at present, and its development will depend in large measure on the interest of students well-qualified for admission to our Department. We suggest correspondence prior to an application for admission. Dr. O’Leary will be at Princeton during the academic year 1976-7. For that period I will be on sabbatical leave, and have accepted the Jerome Clarke Hunsaker Visiting Professorship in the Department of Aeronautics and Astronautics at the Massachusetts Institute of Technology. Letters and re­print requests should be addressed to Princeton, as normally. Subject to total funding and its allocation locally, we hope that a post-doctoral position can be opened at Princeton during the next year. A strong background in planetary physics and/or aerospace engineering would be optimal; considerable versatility and organizational ability would be expected. Because our funding situation is uncertain, however, we may not be able to process applications for several months. National Accelerator Laboratory, Batavia, Il. May 5, 1976. Our mailing list has now grown so large that updating is a problem. If the spelling of your name or any part of the address on your newsletter are incorrect, please send a correction to me at Princeton.